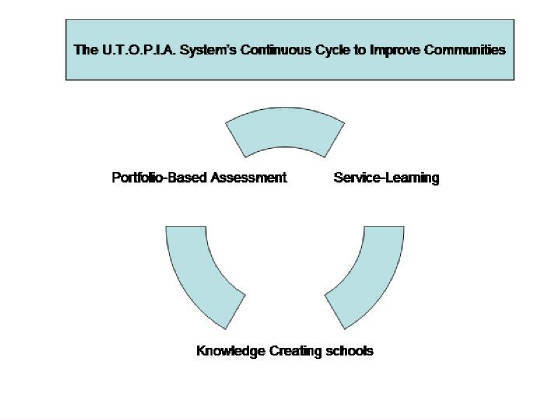 A continuous system to improve communities. The existing system of channeling resources, time and energy outwards. The current direction and focus of resources in a reactive manner. A paradigm shift to channel resources to time and energy. Rethinking and recycling current resources towards time and energy. Why spend hundreds of thousands of dollars to build a Boys and Girls Club building when we already have schools? An ancient efficient way to channel resources to time and energy (the next generation) and create compassionate, enriching, innovative, responsible, secure, peaceful and abundant communities and countries. Channeling our resources to time and energy through Service-Learning and the U.T.O.P.I.A. Project is the most efficient way to cut costs for reactive services and the most proactive way to create innovative, responsible, law abiding and well educated citizens. The updated 2007 results for teenage pregnancy in Arizona! When Service-Learning, the U.T.O.P.I.A. Project and Theresa's Fund Loves Heaven's M.A.GI.C. Chapters are in every school, crime will drop, and less money will be needed for welfare, prevention programs, and reactive organizations.